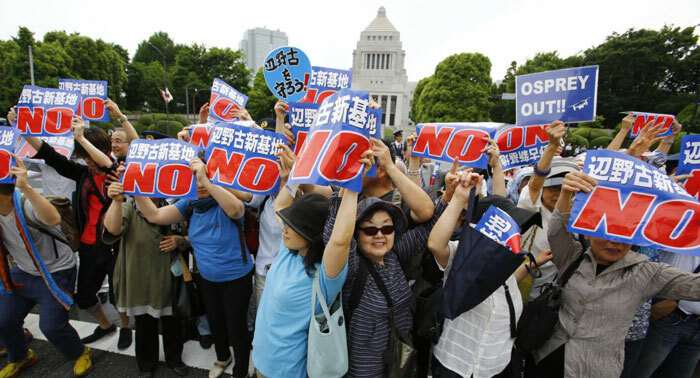 Tens of thousands of protesters in Okinawa vowed to stop the planned relocation of a U.S military base, saying they want it off the southern Japanese island entirely. Opponents of the relocation say the plan to move U.S. Marine Corps Air Station Futenma from a crowded neighborhood to a less populated coastal site would not only be an environmental debacle but also ignore local wishes to remove the base. About 70,000 people gathered Saturday at a park in the state capital of Naha under pouring rain ahead of an approaching typhoon and observed a moment of silence for Okinawa's governor, Takeshi Onaga, who died Wednesday of cancer. Onaga, elected in 2014, had spearheaded opposition to the relocation and criticized the central government for ignoring the voices of Okinawans. He had filed lawsuits against the central government and said he planned to revoke a landfill permit issued by his predecessor that is needed for construction of the new base. Deputy Gov. Kiichiro Jahana, representing Onaga at Saturday's rally, said he will follow through with the revocation process as instructed by the governor and carry on his "strong determination and passion." Okinawans are trying to block the government plan to start dumping soil into Henoko Bay within days to make a landfill for the new site of the Futenma base. Environmental groups say construction at the bay risks corals and endangered dugongs, an aquatic mammal similar to a manatee. Japan's government says the current plan is the only solution, but many Okinawans want the base off the island. About half of the 50,000 American troops in Japan are stationed on Okinawa. Onaga had said Tokyo's postwar defense posture under the Japan-U.S. security alliance was built on Okinawa's sacrifice. The dispute over the Futenma relocation reflects centuries-old tensions between Okinawa and the Japanese mainland, which annexed the islands, formerly the independent kingdom of the Ryukus, in 1878. Okinawa was Japan's only home battleground in the final days of World War II, and the island remained under U.S. rule for 20 years longer than the rest of Japan. Okinawa is still forced to sacrifice for the interest of the mainland, Onaga's son Takeharu, an Okinawa assemblyman, told the rally. "The (relocation issue) is pushed to Okinawa because nobody on the mainland wants it," he said, urging the rest of the country to also think about the issue. "Let us keep fighting so we can achieve my father's unfinished goal and give him good news."